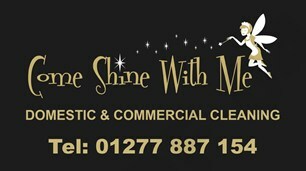 Come Shine With Me - Cleaning Services based in Pilgrims Hatch, Essex. My name is Louise and I run the Award Winning - Come Shine With Me a cleaning service provider. We are a local family run cleaning business, I live in Brentwood and come from Billericay in Essex so am a local well known cleaning services provider. Come Shine with me offers a reliable, trustworthy, efficient service at a competitive price. All our work is documented on our app, we have the ability to show you before and after pictures so you know that you are getting what you pay for in our cleaning service. Come Shine With Me is the winner of the Bark Certificate of Excellence Award 2019. We take pride in our standards and the security of our customers which is why we are fully insured.